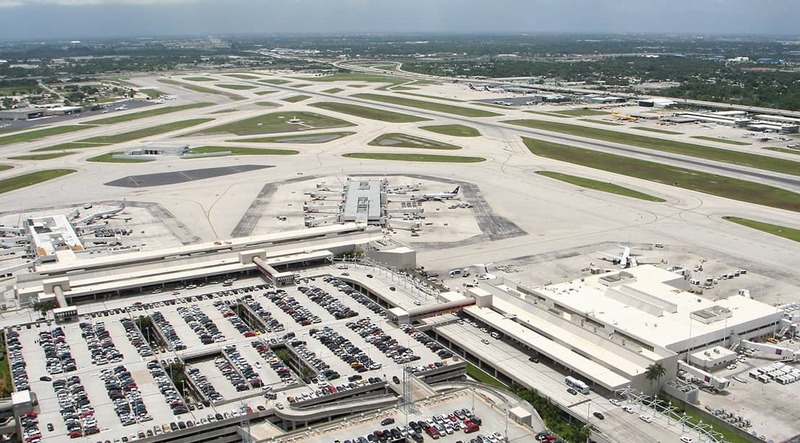 FiberTite® roofing membrane withstands extreme conditions at Ft. Lauderdale Airport. Location: Ft. Lauderdale, FL U.S.A. Situated in the heart of Broward County just minutes from the sandy beaches of Ft Lauderdale, the Fort Lauderdale Airport is one of the fastest growing airports in the country, serving more than 24 million passengers each year. So it’s no surprise that when the airport needed a new roof all work needed to be completed with as little disruption to its travelers as possible. Working between 8pm and 5am, National Roofing of South Florida removed the airport’s existing modified bitumen roof and replaced it with a 410,000 sq. ft FiberTite Roofing System. Designed by CSA Architects of Miami, the mechanically fastened roofing system features a bright white 80 mil FiberTite membrane manufactured specifically to withstand Florida’s blistering sun, jet fuel and the other chemicals associated with the airport’s nearly 1,000 flights per day. After also considering a modified bitumen system, the airport decided on FiberTite due to exceptionally better life cycle cost. Once the FiberTite system was installed, the airport received a $166,000 energy rebate from Florida Power and Light. Couple that with dramatically reduced maintenance costs and FiberTite may cost up to 40 percent less over the life of the roofing system.